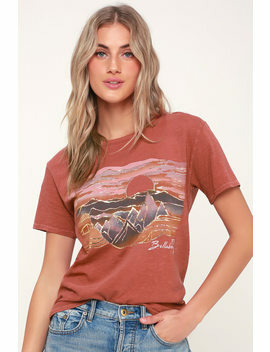 Take the Billabong Be A Tourist Rust Red Graphic Tee along on your adventures from mountains high to valleys low! Soft, slightly heathered cotton knit creates a worn-in, well-loved look across this classic tee with a rounded neckline, short sleeves, and a cool painterly sunset graphic with metallic outlining and logo accent. Pair with your fave jeans and the perfect road trip playlist!